If you have finished Part I, Basic: Rigging Preparation of this tutorial, you are ready to add the Bones to your object, so you can begin Rigging. 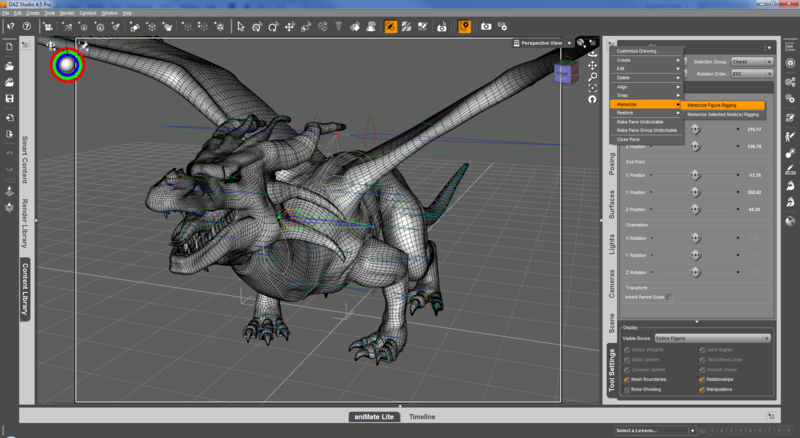 Part II will walk you through adding Bones, setting up your Hierarchy, and editing the Joints, as well as selecting the type of Weight Mapping you wish to do. Before proceeding with the Rigging Articles, it is assumed you have already created a model in the program of your choice, as well as finishing Basic: Rigging Preparation (WIP). The following section will give you instruction on creating the bone structure you will need for Weight Map Rigging. When you select the obj under the geometry list, you will see that all the selection sets you made are listed underneath it. (See Illus 5.) Next, we will create bones that correspond with these selection set names. To do this, drag the obj found under the Geometry List column and drop it onto the Relationships Column directly over Geometry. The bones that have been created need a Hierarchy. In other words, a parent-child relationship that will create a skeleton. Using your leg as an example, your foot, at the very end of the chain of your leg is a child of your Shin Bone, (and the Shin is considered the parent of the Foot.) As you go up, the shin is a child of the Thigh, and the Thigh is a child of the hip. Use drag and drop to set up the hierarchy relationships. Drag and drop in Figure Set Up is designed to drag the child bone to the parent bone to set up the hierarchy. Tongue9 is selected and dragged onto Tongue8, Tongue 8 is selected and dragged onto Tongue7, Tongue 7 dragged to Tongue 6, etc. 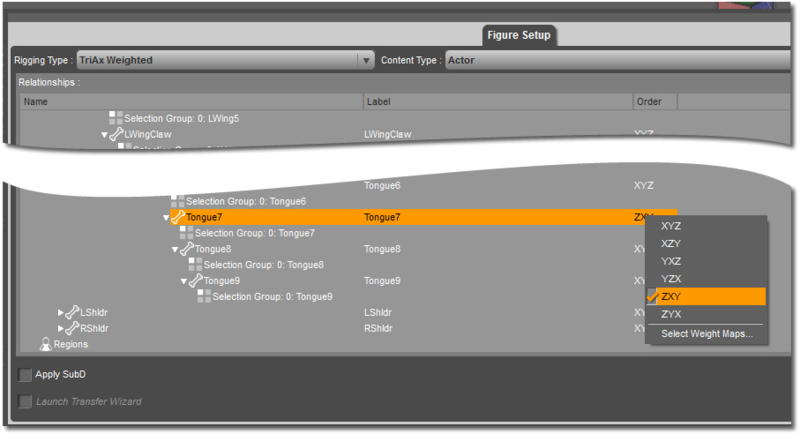 Until we get to the end where Tongue1 is dragged onto the TongueBase group. So where does TongueBase go? It gets dragged onto the Head group. The Eyes also get dragged to the head group, and the Head gets dragged thru the neck groups, the final neck group gets dragged to the chest group, and the chest group gets dragged, to the hip, the root of this figure. Every chain eventually ends at the root. When the hierarchy is complete, its time to change the rotation order of the bones. 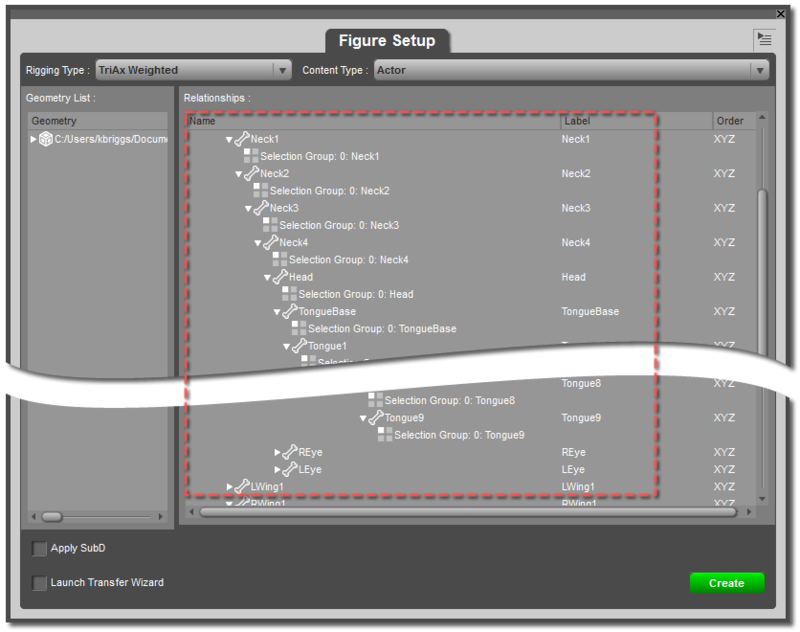 Over to the far right of the Figure Set Up Menu, under the order column, is found a default set up, XYZ. The first axis is the Twist Axis, this is the axis that goes lengthwise through the bone of the geometry. The second axis should be the one that is least likely to reach 90 degrees of rotation. The third axis is the one that is most likely to reach 90 degrees of rotation. Under the Tool Settings at the very top left there is a pointer, open that up to find a menu, choose Memorize, Memorize Figure Rigging (See Illus. 12) This step is very important, you can edit the bones later, but it must be done or the bone placement may be lost on saving. You can still edit the rig at any point after the memorize, even after saving the figure. Bones will still need adjustment in the joint editor after figure set up. Figure set up gets you part way there. The final work for the bone set up happens in the Joint Editor. The Figure Set Up Tool Places the bones in a straight axis, but you will find areas of the model that are not aligned to work with a straight axis and will need adjustment. (See Illus.14) An example would be the Dragons tail. It is not modeled straight back on the Z axis in a perfectly level line. In is modeled in a more natural state, more of a relaxed S curve. 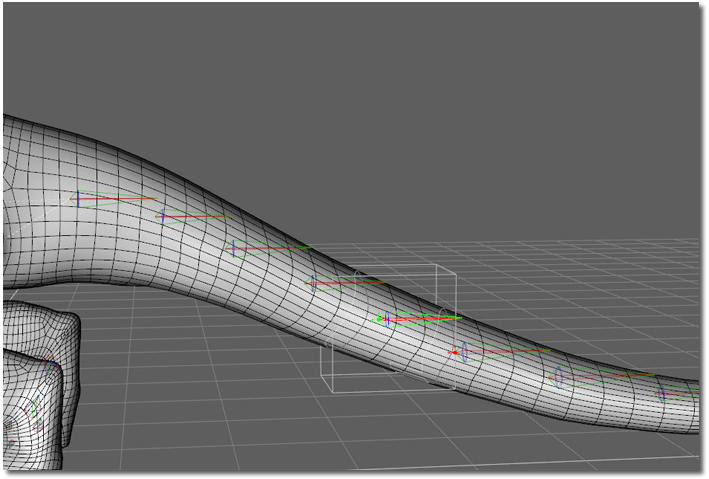 In the joint editor we can adjust the center points so the bones follow the curve of the tail. Reparent Bone... - If a mistake has been made in figure set up and need to re-parent a bone in the hierarchy, use this option. 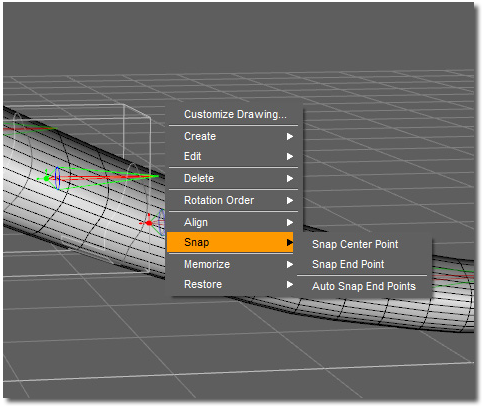 Select the bone that needs changing, Right Mouse Click in the scene and choose Edit > Reparent Bone.... In the dialog box that opens, select the new bone you wish to be the parent. Rotation Order - yes, you can still change that here if needed. Auto Align Node - If this box is checked, adjust any bone to auto align the end point or center point when moved to match it to the bone next to it. Align Node - aligns bone selected based on the end point of the bone selected. Align All Bones - Auto Aligns all bones in the figure. Snap Center Point - Snaps the Center Point of the bone selected to the end point of the Parent of the bone selected. Snap End Point - Snaps the End Point of the bone selected to the center point of the child bone of the bone selected. Auto Snap End Points - If this box is checked, the end points are auto snapped to the center point of the child bone of the bone selected. Memorize Figure Rigging - Memorizes changes made to the rigging. Memorize before you save new changes. Memorize Selected Node(s) Rigging - Memorize rigging of a single node. 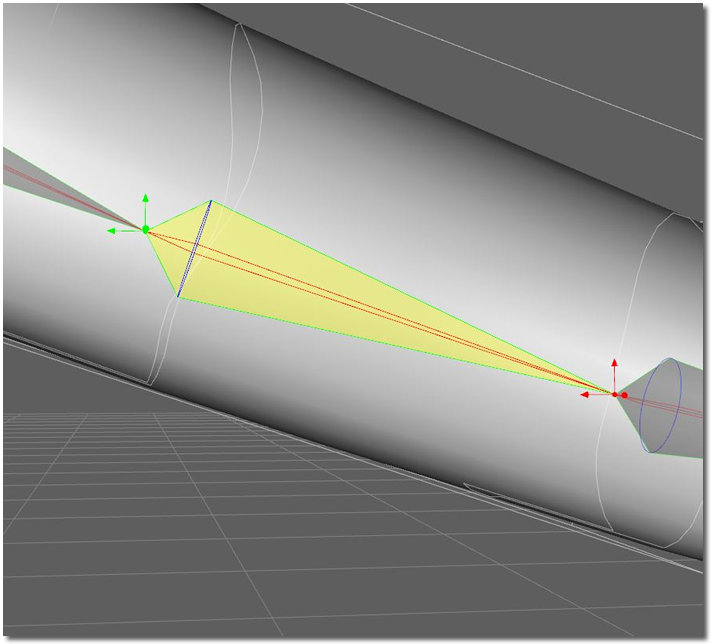 Mirror Joints... - When a figure using the standard left and right prefixes, this option is used to mirror the joint changes made from one side of the figure to the other. The work flow for setting up the bone rigging consists of moving or rotating the bones to follow the angles of the geometry of the model. 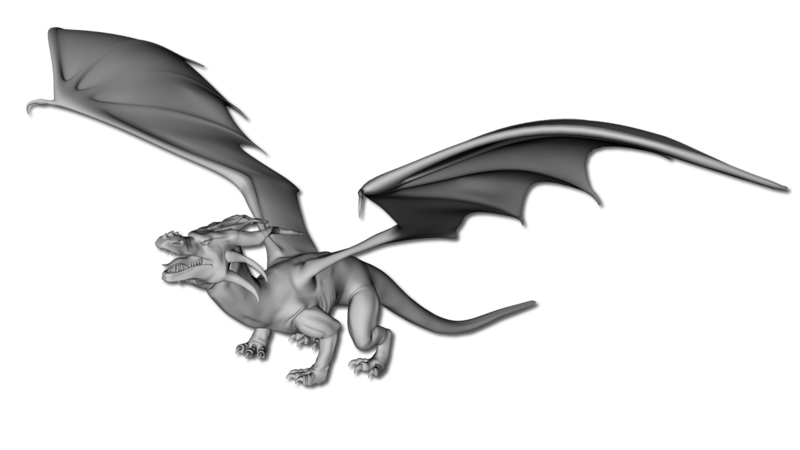 The dragon model has a curved tail and neck. The Figure Set Up room creates bones that align along the x, y or z planes be default. Sometimes this works, as in the dragons chest, and sometimes it does not. In that case, adjustments need to be made to the bones. Each bone has a manipulator at both ends. The Red point at the narrow end of the bone is referred to as the End Point. The Green point at the broader end of the bone is referred to as the Center Point. (See Illus.16) The Center Point is the Pivot point of the bone. The center and end points can be moved by using the manipulators and the ends of the bone. 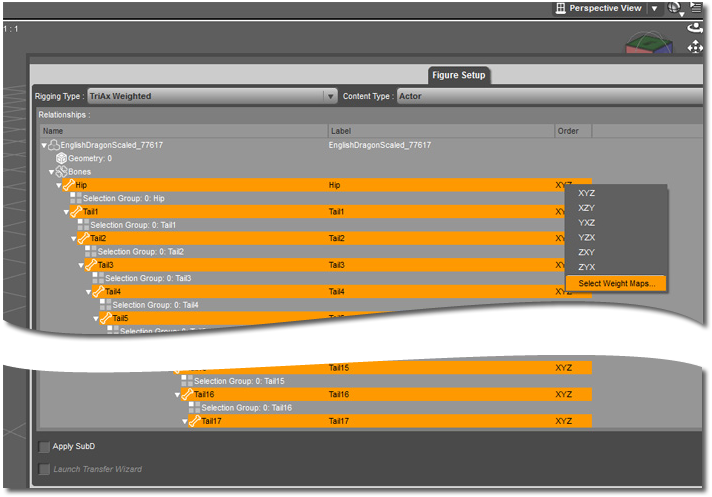 The Joint Editor Tool Settings can also move these by using the sliders, or by typing in numerical values. There is a video which goes into detail about the Center and End Points. While it is for an older version of DAZ Studio, the principles are still very useful. It can be found here: Figure Setup Tools: Joint Editor - Center and End Points. 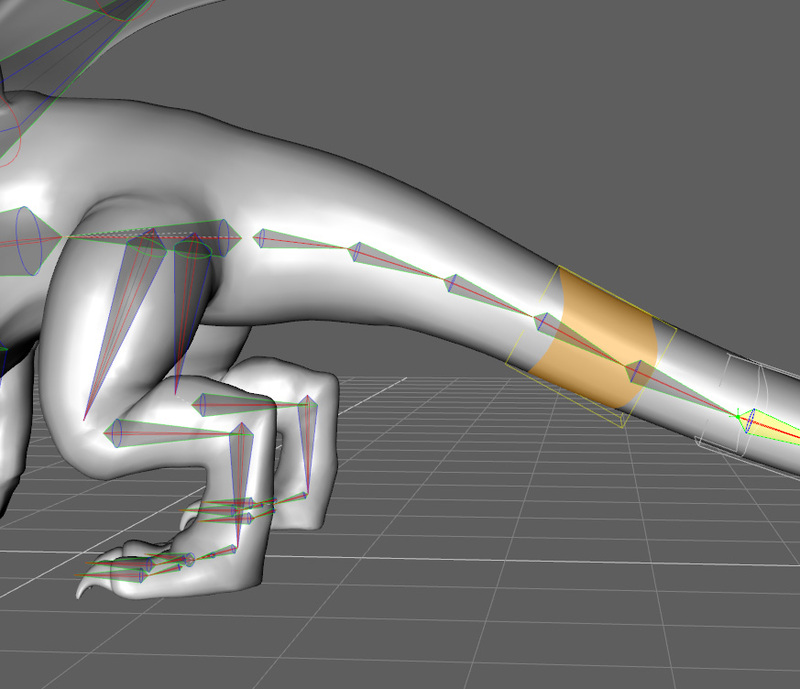 When manipulation on the bones is finished to be in the position needed for optimal bending, Memorize Figure Rigging. 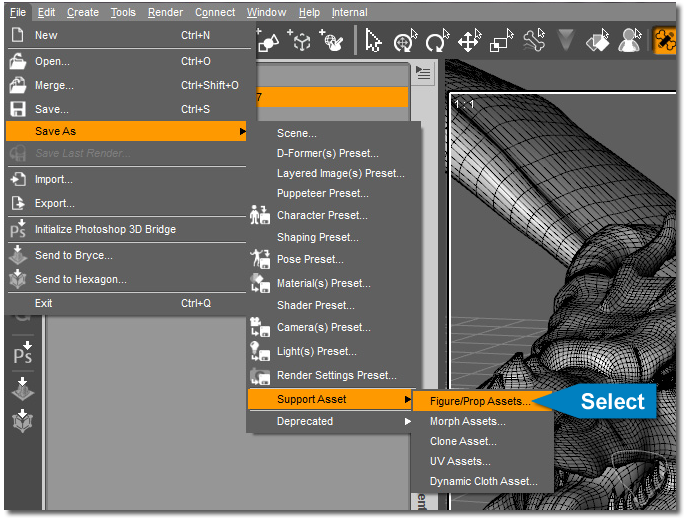 Viewport Tool > Joint Editor > Tool Settings Option Menu > Memorize Memorize Figure Rigging. Make sure to do this before saving your figure, or your work may be lost. At this point, you should have your figure prepped and the skeletal bone structure set. Now it is time to move on to Basic: Weight Mapping a Figure (WIP).